Provides a natural-looking tan. Instant golden tint. Visible application so you can apply with confidence. Even result, anti-streaks. Long-lasting.Discover Sublime Bronze Self-Tanning Gel, a shimmering formula to give your skin an instant golden glow and a sun-kissed, natural-looking tan that lasts all day. Apply with Confidence: The tinted formula allows you to apply the self-tanning gel with confidence. You can see where you are applying it for an even-looking result. Natural-Looking Tan: The Sublime Bronze self-tanning agent works by mimicking the colour of your skin when you have a natural tan. Achieve a tan as natural-looking as you would in the sun. How to Apply? Ensure you properly prepare your skin 24 hours before self-tan application. 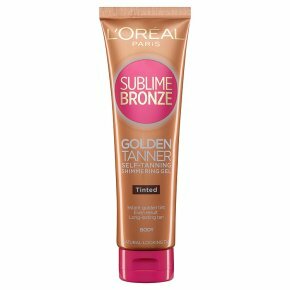 Exfoliate and moisturise with Sublime Bronze Tan Optimisers for best results. Distribute evenly on to clean skin avoiding eyebrows, hairline and eye area. Use sparingly on the elbows, ankles and knees. Wash hands well with soap after application. Your tan will start to appear in a few hours. Use daily until the desired intensity of colour is achieved, and then use 2-3 times a week to maintain it. Apply a second application for a more intense result. Allow the product to dry before dressing. Caution: Does not protect from UV light. Do not apply too close to the eyes. In case of contact with eyes, rinse immediately with plenty of water.